Job management solutions for everyday business. 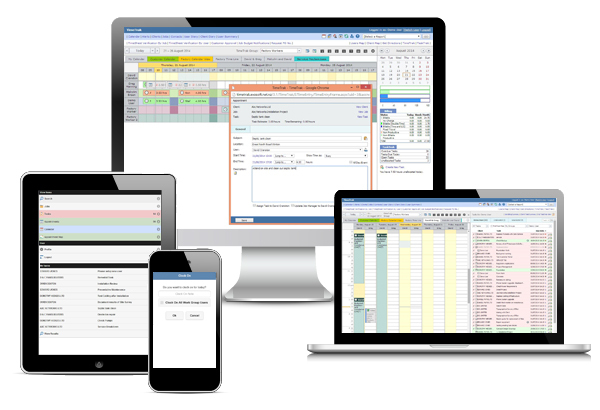 TimeTrak gives you the flexibility to manage your business from any location, using just the one system. It's the answer you’ve been looking for. Designed for businesses in service-based industries, TimeTrak helps you to increase profits, work smarter, and provide better service to your customers. Streamline how your business works from the initial contact and quote through to final invoicing or ongoing support. Whether your staff are out in the field or in the office they can manage jobs, projects, scheduling, quotes, inventory, workplace safety, other team members plus a whole lot more. For Cobalt, TimeTrak is ideal for their technicians who work off-site. “You can have a client with a job that’s in multiple locations. The history information of those assets needs to be available. With TimeTrak, it’s accessible off-site and you can make changes instantly, in real time. TimeTrak is a web-based application that's accessible across any mobile device. Get your business back on track with TimeTrak's GPS tracking solution. Know the whereabouts of your team throughout the work day. Schedule tasks for a workgroup and record time against a workgroup in one simple motion. Powerful job scheduling software that ensures the right person always turns up for the right job at the right time. TimeTrak provides a number of features that assist management with their day to day operations. Create prospects or opportunities in TimeTrak Mobile, then create an opportunity quote and track activities along the sales process. Enhance team collaboration and knowledge. Customise your data with this powerful solution. Since implementation of TimeTrak, Unidata have experienced improved visibility and accuracy of tracking time spent on individual or group jobs/tasks/projects, improved job transparency and prioritisation, and enhanced overall efficiencies.